Now let's look at an Image component example that will paint on a bitmap. The idea is simple. I've basically written a simplified version of the Shape example, by placing an Image component on its form and redirecting all the output operations to the canvas of this Image component. In this example, ShapeBmp, I've also added some new menu items to save the image to a file and to load an existing bitmap. To accomplish this, I've added to the form a couple of default dialog components, OpenDialog and SaveDialog. One of the properties I had to change was the background color of the form. 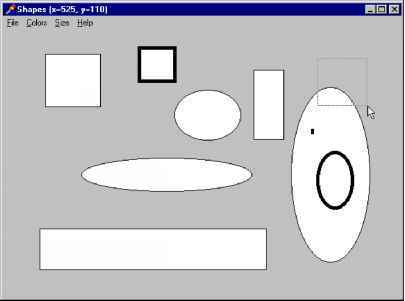 In fact, when you perform the first graphical operation on the image, it creates a bitmap, which has a white background by default. If the form has a gray background, each time the window is repainted, some flickering occurs. For this reason, I've chosen a white background for the form, too. To avoid overly complex file support, I decided to implement the File ^ Load and File ^ Save As commands and not handle the Save command, which is generally more complex. I've simply added an fChanged field to the form to know when an image has changed, and I've included code that checks this value a number of times (before asking the user to confirm).